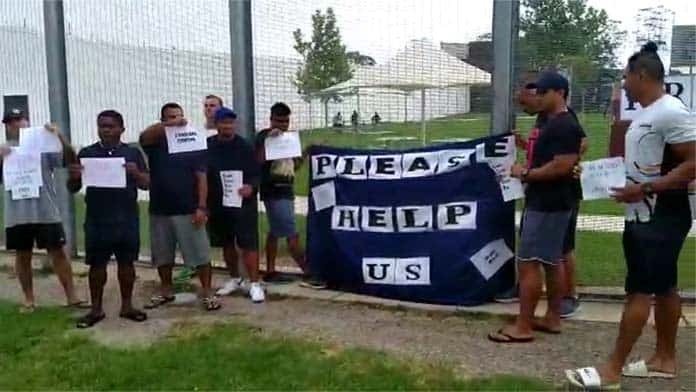 As Solidarity goes to press, immigration detainees in detention centres across Australia are staging a hunger strike protest over detention conditions and extraordinary Ministerial powers that allow the Minister effectively to keep people in detention indefinitely. Most, but not all, the detainees in the hunger strike protest are so-called 501s—people who have been convicted of some crime (usually not serious) and whose visas are cancelled under section 501 of the Migration Act. The powers extend far beyond the power of the criminal justice system. Even those who are charged and found not guilty or whose charges are not proceeded with, can have their visa cancelled on character or national interest grounds. The legal powers introduced in late 2014 are part of the Coalition’s toxic nationalism to systematically demonise migrants, refugees and non-citizens in general. People are being held in detention sometimes longer than any sentence imposed on them by a court, effectively on the whim of the Minister. The conditions in the new maximum security compounds in MITA, BITA and Yongah Hill are appalling. Videos of Serco Emergency Response Teams brutalising detainees have emerged from MITA but have been ignored by the government. Guards have powers to arrest and impose punishments that are completely unaccountable. Handcuffs are universally used whenever detainees are moved—even to doctors’ or dental appointments. They are handcuffed even to hospital beds. In MITA, detainees are locked in their rooms from midnight to 7am. There are no TVs and the only seats are stainless steel stools bolted to the floor alongside stainless steel tables also bolted to the floor. The protests have lifted the lid on the abuses that are part and parcel of the mainland detention regime. The militarisation of the detention centres has also gone along with tightening up the conditions for visits, so a visitor can only visit one person per day and must give five working days’ notice of a visit that has to be booked online. It is detention—onshore and offshore—that is the crime.